Stock and broth, whether beef, chicken, pork, seafood, or even vegetable, are essential cooking ingredients. If you're wondering what the difference is, broth (or bouillon) is generally made from bones and meat. 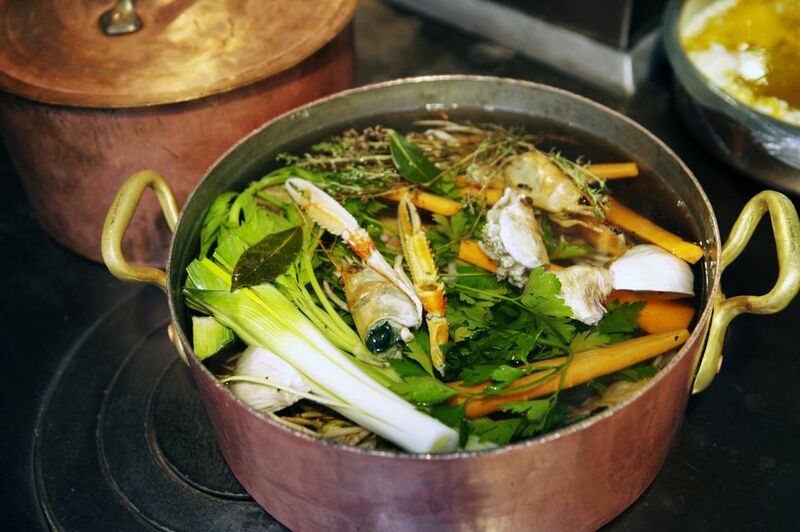 Stock includes not only the bones and meat but also aromatics such as carrots, onions, bay and so on therefore stock has a much more complex flavor than broth. You'll reduce the stock a fair bit to begin with and may reduce it further when making a sauce so adding salt in the beginning can result in a mixture too salty to use. Stock is time-consuming to make – but involves relatively little hands-on time. Figure about 30 minutes of prep and 4 to 12 hours of simmering (the longer it cooks, the richer the flavor). Consider it an easy (and tasty) weekend project. Also, you'll want at least an 8-quart stock pot. This needn't be expensive, I picked up a set of three stainless steel pots (12, 16, and 20 quart) at Costco several years ago for $60 and you can get a decent pot at Target for $30. You don't need something fancy or expensive like All-Clad or Calphalon, but get something big and go for either stainless steel or enameled. The basic ratio I use for making stock is 4:1 1/2:1/2:1/2. That's 4 pounds of bones and meat, 1 1/2 pounds of onions, and 1/2 pounds each of carrots and celery. This ratio works for beef, chicken, turkey, ham/pork, veal, whatever the meat is and makes about 2 quarts of stock. The quantities needn't be at all precise. Once you've assembled your primary ingredients you have a choice of making either a dark stock or a light stock (although beef will always be somewhat dark). The color difference depends is whether or not the ingredients are roasted before going into the stock pot. You also have the option of roasting just the bones/meat or roasting the aromatics (vegetables) as well. Roasting produces a much richer flavor so I usually do so for both. Roasting the bones and meat also results in a less fatty stock and a clearer stock because much of the fat is rendered in roasting and the proteins are denatured (clump together) so you don't have the proteins breaking down in the stock and making it cloudy. Obviously if you're using the bones leftover from a roast turkey or standing rib roast this decision is made. If I'm roasting the meat I pour off all the fat at the end, deglaze the pan with water, and add the juices to the stock pot. Herbs and spices are also a frequent addition to stocks. Bay leaves are almost de rigueur as are pepper corns. I also like adding a handful of fresh parsley (stems and all) to stocks made with chicken or turkey. But as a rule I keep it simple unless I'm planning to use the stock immediately for a particular soup or stew because I don't want the flavors interfering with a sauce I make three months from now. Note: do not add salt to the stock or it will become too salty as it reduces. I also sometimes add a bit of anchovy paste, soy sauce, or a parmesan cheese rind toward the end to boost the savoryness. All of these contain MSG which makes the stock more savory and sometimes I even add straight MSG (Accent). You don't need much. 1. Trim, peel, and quarter onions. Break carrots and celery into large pieces (note, leave the leafy greens on the celery). Add to an 8-quart pot with meat and any other herbs (but not pepper corns). Fill pot to within 2 inches of top and set over high heat. 2. When bubbles begin to form, reduce heat to medium-high. Repeat, reducing heat to medium, when bubbles form again and continue to repeat until the pot is simmering very gently over low heat. 3. As the pot simmers, scum will form at the top, skim it off and discard. By the time you reach low heat there should be no more scum, add the pepper corns (they float, so if you add them while you're skimming you'll skim them off). 4. Once the pot reaches low let it continue to simmer, partially covered, for 3 – 11 hours, just checking it on occasion, and adding more water if the level drops below the top of the ingredients. 5. When done, strain the solids out and throw them away. Let the stock cool, then refrigerate overnight. 7. With these little bags of goodness in my freezer I can easily make an excellent sauce at a moments notice (I thaw the bags in hot water). If I don't need a cup of stock I'll partially thaw it; crack the frozen stock, in the bag, with the back of a heavy knife; and refreeze what I don’t use. One final thought. Never throw away bones whether cooked or raw, stuff them in a bag and freeze them until the next time you make stock. For that matter, never throw away shrimp, crab, or lobster shells. Even if you're just making some chicken soup, adding the bones from a roast chicken will make the soup all that much richer and flavorful and such bones can go in the pot still frozen.